I love when the universe conspires to make me happy. First I discovered my new favorite chocolate. It was part of a goodie bag prepared for me by the Program Chair at the East Cobb Quilting Guild in Marietta, GA two weeks ago. Hotel Snackage. It was so delicious I took a picture of the wrapper, the chocolate having been most enthusiastically consumed earlier. Rapidly consumed. All in one sitting. I love dark chocolate. 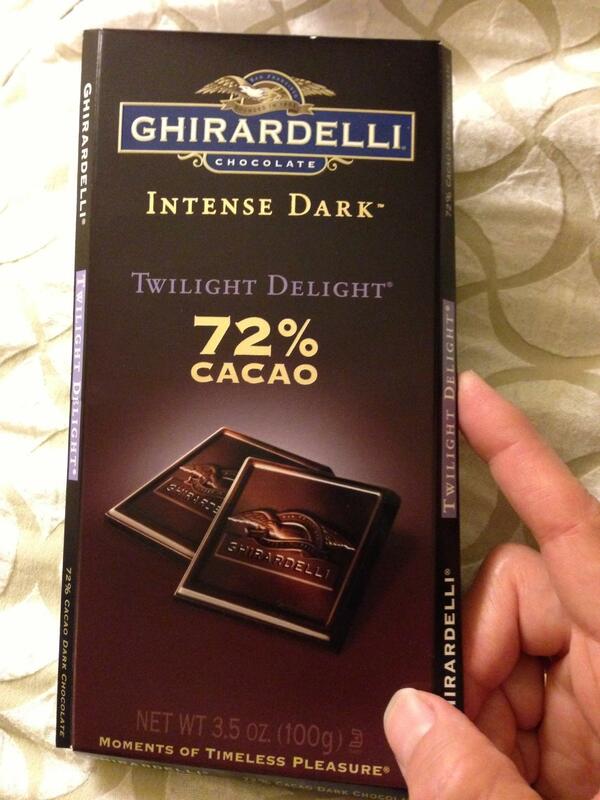 Ghirardelli Intense Dark (Twilight Delight) is delicious. That dark chocolate might even be good for me is an added bonus. It’s loaded with antioxidants, improves blood flow, is high in vitamins and minerals, and might even harden my tooth enamel! That’s pretty wonderful, isn’t it? I feel healthier and so much less guilty already. But wait. I just got back from Rite-Aid. I was shopping for knee-high’s and little bottles of hair spray for my upcoming trip to visit with the Cabin Fever Quilters’ Guild in Fairbanks (still a few spaces in the workshops). Rite Aid moved the little bottles of overpriced travel cosmetics again and as I wandered around looking for them (their plan all along) I bumped into the Ghirardelli chocolate section! Hang on. It gets even better. When I paid I used my Wellness Card (Rite-Aid’s loyalty program) and I got $2 for buying the knee-high’s (no idea why) and another $2 for the buying the chocolate (no idea why). So, what does this mean? The chocolate will still be on sale until the end of the month and I’ve got $4 in free money. I can get two more bags of Twilight Delight tomorrow for only $2. At that price I might even be willing so share. Would anyone like some knee-high’s? Hair spray? Chocolate? What chocolate? I don’t see any chocolate. Ami Simms is a traveling quilt teacher and the inventor of Sticky Template Plastic. Sign up for her free newsletter so you don’t miss more helpful “news” like this.